The Expendables 2 will have no problem fending off two weak newcomers at the box office this coming weekend. Action films like The Expendables 2 tend to fall really fast, so don't be surprised if the Lionsgate release suffers a sophomore decline of more than 50%. Yet even if it suffers such a substantial drop, the action flick will definitely stay #1. An 82% combined approval rating from nearly 46,000 Flixster users indicates that word of mouth is solid. As of 4 p.m. PT, Fandango reports that The Expendables accounts for 10% of daily sales. 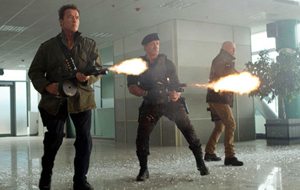 Look for The Expendables 2 to take in $14 million this weekend. Even though it boasts a supporting turn by Bradley Cooper, Hit and Run lacks the kind of star power needed to get moviegoers away from the beach during the end of August. As a result, Open Road is using the raunch factor as the film's main selling point—a technique that can only deliver limited result. Fandango reports that Hit and Run has yet to break into the daily top 5 list. Expect Hit and Run to take in $10 million from Wednesday-Sunday at 2,700 location, $7 million of which should come from Friday-Sunday. Premium Rush represents a big test for star Joseph Gordon-Levitt. The young actor is picking up momentum thanks to supporting turns in Inception and The Dark Knight Rises, but he may not be ready to carry a film on his own yet. Expectations are modest for Premium Rush as a result. Fandango reports that Premium Rush didn't crack the daily top 5 list. Premium Rush looks poised for a $9 million debut frame from around 2,100 locations. The Apparition is clearly being dumped. The Warner Bros. release failed to gain any real traction in the months leading up to release, so there is some loss cutting happening here. The horror flick should grab a paltry $2.5 million from around 800 locations. Keep a close eye on 2016: Obama's America this weekend. 2016 has clearly hit a nerve among the anti-Obama crowd, and Rocky Mountain Pictures is confidently expanding it to more than 1,000 locations. The political doc leads daily sales on Fandango with 34%. Your story is very interesting, my friends are also concerning about this topic. Your topic give me more knowledge to share with my friends. Thanks!